This summer has me so overwhelmed with change that I feel like part of me has shut down to cope. I am operating more in logic and less in feeling. The feelings will have to come later. Before we knew we were moving to a new state, we signed Full Speed up for a three-week academic class held on a college campus. Even then, while I was thrilled for him to have this unique opportunity, I was not particularly happy about him being away for three weeks. Throw some travel and our family changing addresses into the mix and I am surprised I am still standing. The most unsettling part of this process with Full Speed was how extremely collegiate it all felt. We had to make sure he had linens and towels. He also needed shower shoes and a caddy for supplies to be used in the dorm showers. Mad Dog and Full Speed unpacking and organizing his dorm closet. Once we arrived at his dorm, it continued to take on a surreal quality. A feeling of yes, he is only thirteen, and yes, he will return home, but also a feeling of what our future without Full Speed may look like. It’s not great, folks. Not great at all. The positive is we obviously love our kid and should be grateful that we are missing him. It would be rather telling if we broke out the bubbly and celebrated his departure with a joyful clink of glasses. There was no toasting. Only a sinking sensation that Full Speed is well on his way to carving out his own life. I cannot tell you the willpower it took to not cry when we left him at his dorm. I held it together. I don’t know how, but I did. My goal is to stay focused on the present moment and be mindful of what will feel supportive to him in terms of how much I communicate with him. Unfortunately, him live-streaming his day to my phone is not an option. Instead, I sense he is consumed by new routines, meeting new people and mastering the intensive curriculum ahead. Texting his mom should not be a priority. I don’t have to like it, but I get it. I have always known that my children have never really been mine. The most ‘ownership’ I can claim over them has maybe been the nine months I carried them. Once they arrived in the world it has been my one of my greatest honors to walk along beside them as I do my best to let them go. Now, more so than ever before, it is time for Full Speed to walk ahead alone. I love you, Full Speed. I am so proud to be your mom. May this opportunity open your eyes to the infinite possibilities of life. And remember, I am only a phone call away. For the record, I can neither confirm or deny if T.Puzzle is missing Full Speed. I can confirm he totally does though he would never say it out loud. And, I thank my lucky stars to have this one-on-one time with him. He is a funny dude and makes me laugh … a lot. I totally get that baseball is a game of inches. A couple of inches left or to the right, and a foul ball potentially becomes a 3-run shot. This is part of baseball’s charm. As charming as this is, if you fly across the country and spend money on a hotel and tickets, it’s always helpful to see your team win. Especially if you go four times you figure the baseball gods have to smile down upon you at least once, right? It didn’t seem that way. It seemed the more we sojourned to Wrigley, the more victory eluded us. As we approached game four with no win in sight, I was losing hope. Of course I loved being at Wrigley, but still…was I asking too much to see one teensy-weensy win? After watching the third defeat, my normally cheery attitude (that’s right, Mad Dog, I’m all about the cheer) had taken a turn. Let’s just say this World Series Champion was downright crabby, just ask our cabbie (I keep spontaneously rhyming as of late, should get that checked out, and truthfully, we used an Uber, but what the heck rhymes with that?!). Once we were back at our hotel, my mood continued its downward spiral. Mad Dog knew we needed to change course. He insisted we all get dressed up and take advantage of the city. 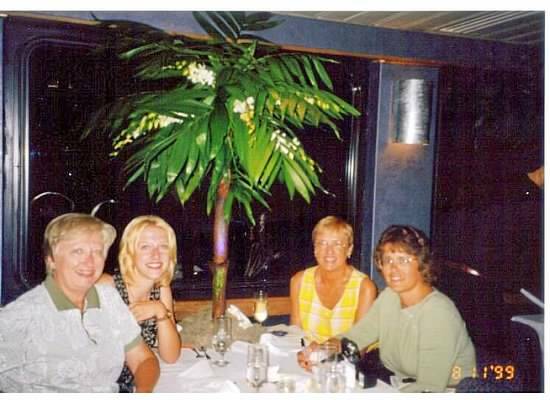 We would try a new restaurant and then go for a carriage ride. All he had to do was get me out the door and all would be well. He was right. We ended up having an awesome night. After a great dinner, I was so looking forward to our carriage ride. It’s one of my favorite things to do when we are in Chicago. The city is gorgeous lit up at night and it’s fun to see it from this vantage point. That’s the whole idea, getting to see things out of the ordinary. This particular carriage ride did not disappoint to put it mildly. She was clearly panicked for some reason. Was it an accident? Was a crime of some sort taking place? I was starting to get very nervous. No, it was neither of these. It was a naked bike ride. Yes, you read that right,…naked! There were hundreds and hundreds of naked people riding gleefully down Lake Shore Drive. Full Speed went white with shock and T.Puzzle couldn’t stop laughing. I simply marveled at how one actually rides a bike sans underpants. Painfully so I would imagine. Mad Dog? Well, he did the only thing he could do, he pulled out his phone and starting snapping pictures. Sadly or gladly(? ), there’s that rhyming thing again(! ), I won’t be sharing those pictures here. In fact, I never want to see those pictures again for the rest of my life. We hurriedly paid our guide and made our way back to our hotel. By then, much to our relief, most of the birthday-suit bikers had passed through. However, the memory will forever linger in a can’t-ever-unsee-that-kind-of-way. The next baseball trip we take they better win every game we attend. The only shock and awe I expect from this point on is that the Cubs play deep into October and that everyone in the glorious city of Chicago keeps their pants on…. I think that’s reasonable, don’t you? We were racing through O’Hare International Airport. I felt the adrenaline coursing through my veins as we embarked on the first phase of our summer vacation. No, we weren’t racing to make a flight or anything like that. Mad Dog, in that way of his, was pushing us to get to…wait for it…baggage claim. We weren’t even late for anything. He is a man who can’t stand to be still so what happens when you land at your destination? You sprint to baggage claim naturally. They didn’t break stride as they looked towards me. You see, the night before, Mad Dog ‘asked’ me what time I planned to set my alarm for. The truth was, he already had in mind the exact time he wanted. It was also clear that I was the back-up alarm. Not great. Not great at all. Of course we went to Wrigley Field, goes without saying. Now you know the girl had a happy ending. She found true love and had two, awesome little Buckeyes. But, there’s more to the story. Before there was the Buckeye, there was just the girl. She was a quiet girl. She grew up tucked away in the cornfields of Illinois in an unassuming one-story house on an unassuming tree-lined street. This quiet girl loved her Mom dearly. When the girl would arrive home from school she would find her Mom watching the Cubs on WGN. At first the girl didn’t think much of baseball, but she thought much of her Mom. Over time, she was slowly indoctrinated with a die-hard love of the Cubs. It was in her genes passed all the way down from her Grandmother. You can’t fight genes. The girl’s bond with her Mother, and remember, they already were quite close, grew stronger over a shared love of the Cubs. 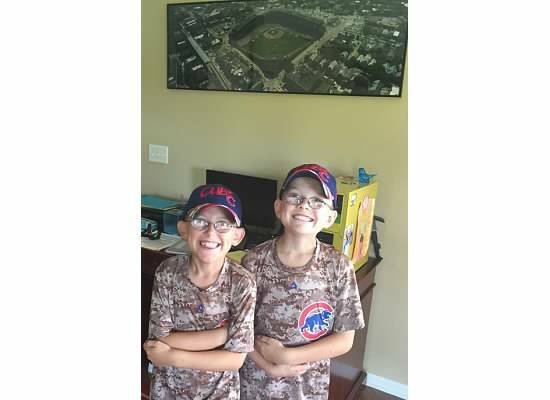 The Cubs were often uninspiring to watch and even though the girl and her Mom cringed each time Harry Caray slurred his way through a seventh inning stretch, they were faithful to their team. Of course, there were moments of glory. The ’84 Cubs stirred hope in their hearts and while this season brought great joy and this amazing song- Men in Blue – it ended in heartbreak as practically every Cubs’ season does since the dawn of time (boo Padres!). So, how exactly does the Buckeye factor into all of this? 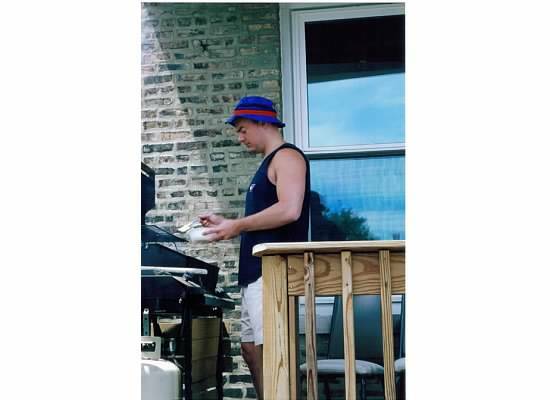 Turns out, he was not much of baseball guy (growing up, soccer was more his thing), but attending college on the far, far north side of Chicago lends an easy transition to Cub fandom. The girl suspected initially his fandom was less about the baseball and more about the ever-available and free-flowing beer of the Friendly Confines’ bleachers. No matter, he was a Buckeye who grew to appreciate the Cubs. And, that’s how they met. 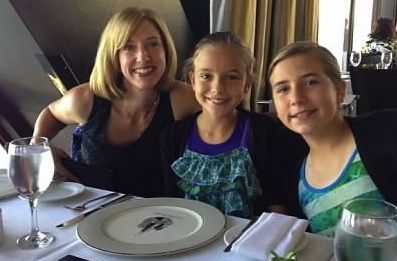 The girl, her Mom, her Aunt and Cousin all travelled to Navy Pier to go on a Cubs’ charity dinner cruise. There, they got to meet their favorite players (yes, the girl still has a soft spot for Mark Grace), and there, the Buckeye was. He was seated at the table next to them. He was with friends and the girl didn’t notice him at first. However, SEVERAL other girls noticed the Buckeye (the girl didn’t find this out ’til much, much later). To her credit, the Cousin recognized the Buckeye appeared to be without a date. Being that she knew the girl was very, very single, encouraged the girl to talk to him. Initially, the girl did not agree to talk to the Buckeye as she was skeptical of all men, but since she was giddy at having schmoozed with so many handsome Cub players, she reluctantly agreed. He offered to take her to Wrigley Field and watch a game from the bleachers. She had never watched a game from the bleachers and as a die-hard fan, this offer was extremely tempting. It took a couple weeks, but eventually, the girl and the Buckeye set up a date. The girl wasn’t very nervous as she had all but given up on love. 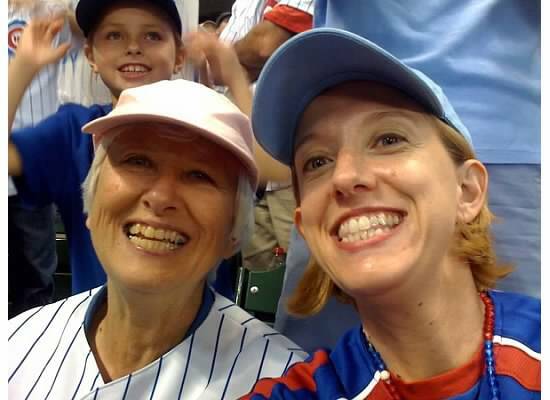 She was just happy to get a free ticket to watch her Cubbies in person (she was also extremely poor at the time). She took the bus from her northside neighborhood and met the Buckeye at his apartment on Sheffield. Yes! He actually lived across the street from Wrigley. Wow! Maybe this Buckeye was something special. The girl didn’t know it, but she pretty much fell in love with the Buckeye right off the bat. As we know, the Buckeye was a lot slower in this regard. A. LOT. So began their up and down romantic history which included countless bleacher games at Wrigley Field. It wasn’t always a fairy tale, but it turned out amazing in the end (the relationship, NOT the Cubs’ season). 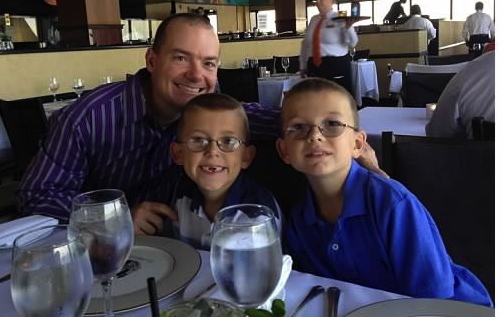 Once they were married and raising their boys Buckeye, they still followed the Cubs closely. However, soon after starting their family, tragedy struck. The girl’s Mom got sick and passed away so suddenly, it crumbled the girl’s world completely. The girl’s heart was shattered into a million pieces. She didn’t understand how just when her little Buckeyes were getting more awesome every day, that her Mom wouldn’t see them grow up. She wouldn’t be there to call when the girl didn’t know if she was mothering them correctly. She wouldn’t be there to laugh with, or cry with. Six years later, the girl was still a little bit lost without her Mom to anchor her. And, during those six years of grief, the girl couldn’t bear to watch the Cubs and not just because they were terrible (as they usually were), but because watching them without her Mom was too deeply painful. It hurt her soul to watch them. The girl was pretty sure she would never love baseball again. She focused on her little Buckeye family and let the Cubs drift slowly away from her. Somehow, the Buckeye sensed under all her hurt, that the girl still loved baseball. This baseball season he made a decision. He would get the girl access to all the Cubs’ games on TV and download an MLB app on her phone (which is awesomely addicting). The girl doesn’t know how he knew she was ready, but she was. The brokeness of her heart, while not quite fully healed, had scarred over enough that it made watching the Cubs bearable. Actually, she had healed enough that she was excited to watch them play. Hearing the crack of the bat, watching a perfectly executed double play and hearing the fans of Wrigley cheer made her happy once again. She couldn’t believe it. And, to add to her happiness, her two little Buckeyes have shown the beginnings of their own Cubs’ genes emerging. Finally, she could share something with them that was unique to her. It was amazing-ness. Time doesn’t necessarily heal all wounds, but it makes it possible to live life anew. 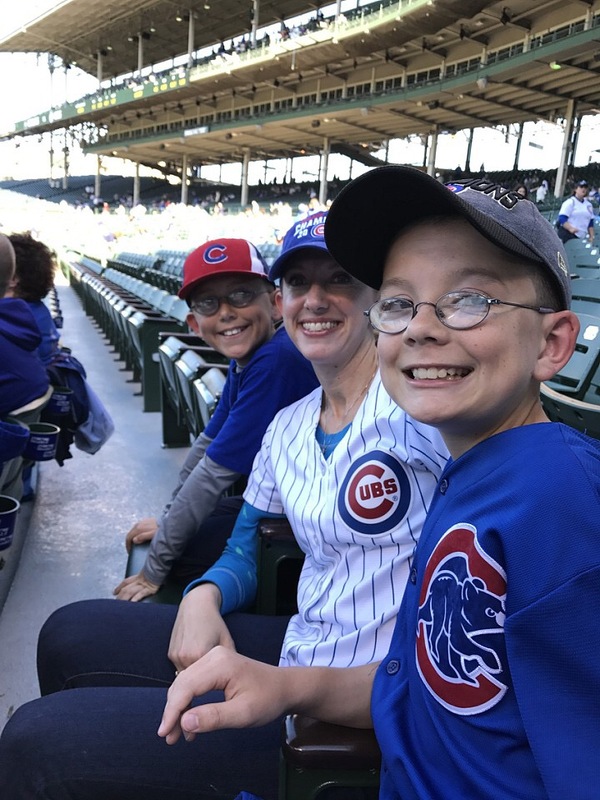 While the girl will never share a Cubs’ World Series victory with her Mom (or with anyone for that matter given the Cubs’ history), she can at least remember she really does love baseball. She really does love her Buckeye and she really does love her boys. And, she really was the most blessed daughter to have had a Mom as special as the one she was given. 1. On our trip up north, Full Speed showed us some genuine gratitude. We were all set to get him a soccer t-shirt while we attended the USMNT‘s Gold Cup Championship game at Soldier Field. He was so thankful to be attending the game, that he politely declined. He said being at the game was more than enough. Needless to say, he got a t-shirt anyway. I would have gotten him a car, too. I basically would have gotten him anything he wanted. 2. 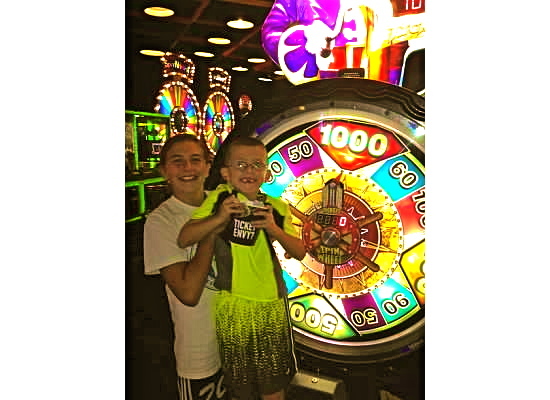 Even though T.Puzzle continues to insist on asserting his independence from me, when he won 1000 tickets at an arcade, he rushed to tell me all about it. I guess maybe he hasn’t outgrown his Mom after all. That’s a relief. Seriously. 3. We did lots of spectacular things this summer especially in Chicago. Watching the men’s team win the Gold Cup, eating on the 95th floor of the Hancock, riding the ferris wheel and a surrey bike at Navy Pier and carriage ride at night downtown just to name a few. Out of all these things, some of my favorite moments were the ones where conversations with my nieces and my boys would unexpectedly flow. Sure, we were experiencing unique and awesome events, but the true wonder was simply being together. Too bad summer can’t last forever.